The Book Panel displays dictionaries, encyclopedias, topical guides, and regular books. As with the Bible and Commentary panels, the tabs at the top of the display allow you to switch between library resources (in this case, other books). In this example, the Smith and ISBE tabs are specially colored because they also have entries titled Weapons. You can create your own books, where you can easily store personal topical studies, Bible lesson plans, sermons, etc. 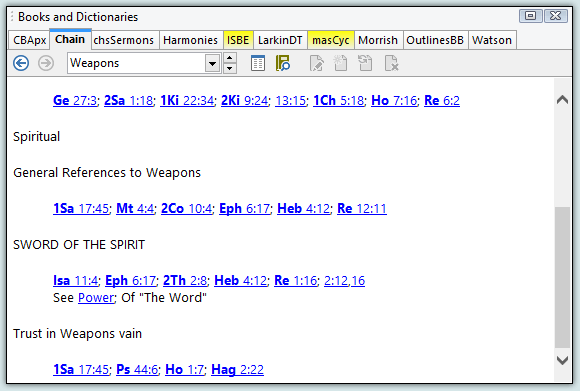 Any verse references you type are automatically linked to Scripture.